SNES Super Mario All-Stars: The Lost Levels (USA) "warpless, Mario" in 35:08.82 by cpadolf. 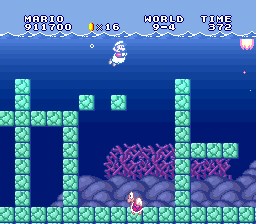 The Lost Levels is the remake of the game released in Japan as Super Mario Bros 2; it is an exercise in Fake Difficulty, containing very difficult jumps, many enemies, problematic terrain, poisonous mushrooms, and, at worst, koopa jumps over walls or across pits. Most of it is senseless rehashing of elements in places where they don't belong (like amateur hacks). It's so difficult to beat that Nintendo of America released a wholly different game given a Mario theme as Super Mario Bros 2. Of all the games in Super Mario All-Stars, it's the only one in the set that saves your progress at individual levels rather than the start of worlds. It's that bad. This movie, about 7 seconds faster than the previous, plays all levels, including the secret world 9, and extremely difficult A through D worlds.